From crisp grains to crunchy cookie bits to protein crisps to precooked flours, our twin screw food extrusion systems are designed to accommodate a broad range of products. Food extrusion is one of the oldest and most reliable forms of food processing, dating back well over a century and expanding to cover more and more food sectors. As technology improves, so does food extrusion. The food extrusion process involves forcing mixed ingredients through a perforated plate or die in order to cut the end product into a specific size and shape. A food extruder typically is used for such products as breads, confectionary, cookies, cereals and even pet foods. At PacMoore, our primary product emphasis is on value-added inclusions for use by our customers in further processing. These include direct expanded cereal-based inclusions, high density pellets, and texturized vegetable proteins among others. We are able to produce a variety of finished snack items as well. 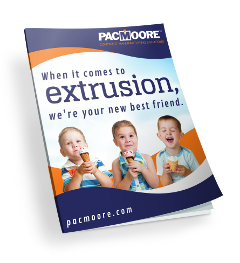 Extrusion technology has come a long way, and so has PacMoore. We use only state-of-the-art food extrusion equipment to offer you efficient and reliable services. On June 22, 2015 the PacMoore Innovation Lab in Gridley, IL was opened and dedicated to the glory of God with a Proverbs 16:3 plaque that is placed on all new PacMoore buildings. 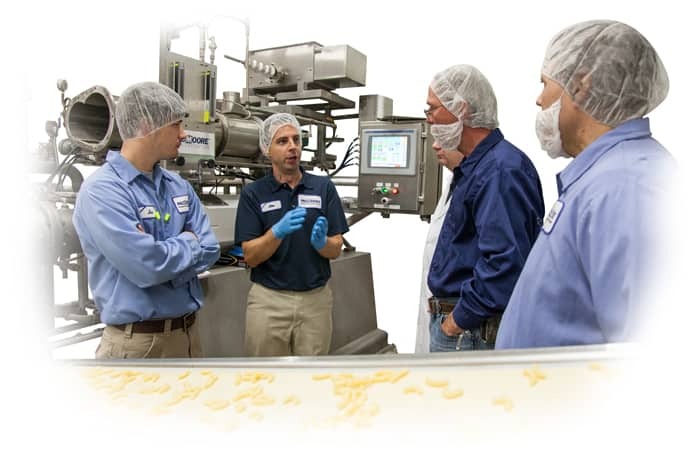 This site was designed with our customers in mind – to offer product development support by utilizing our Wenger TX-57 twin screw pilot extruder and PacMoore’s own Jon Baner – our Senior Technical Manager, a Certified Food Scientist, and a guru in the field of extrusion. To learn more about PacMoore’s food extrusion capabilities and services, contact us today. Do you have additional questions for our Extrusion Department?